Explanation: Like a fleet of futuristic starcruisers, NASA's highly successful series of High Energy Astrophysical Observatory (HEAO) spacecraft appear poised over planet Earth. 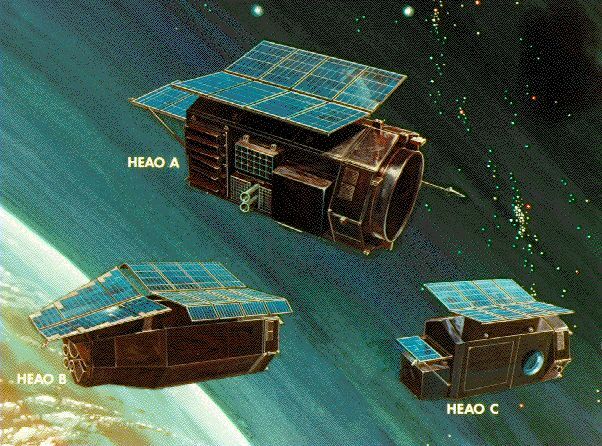 Labeled A, B, and C in this vintage illustration, the spacebased telescopes were known as HEAO-1, HEAO-2, and HEAO-3 respectively. HEAO-1 and HEAO-2 were responsible for revealing to earthlings the wonders of the x-ray sky, discovering 1,000s of celestial sources of high-energy radiation. HEAO-2, also known as the Einstein Observatory, was launched in November 1978, near the date of the famous physicist's 100th birthday and was the first large, fully imaging x-ray telescope in space. HEAO-3, the last in the series, was launched in 1979 and measured high energy cosmic-ray particles and gamma-rays. These satellite observatories were roughly 18 feet long and weighed about 7,000 pounds. Their missions completed, all have fallen from orbit and burned up harmessly in the atmosphere.